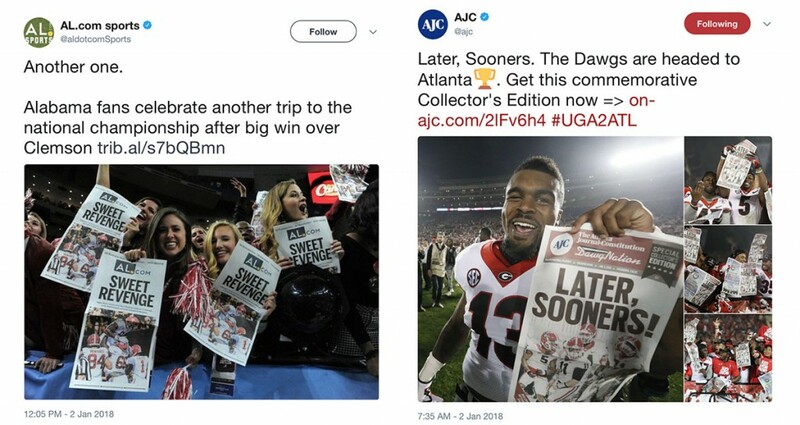 AL.com and the Atlanta Journal-Constitution pre-printed commemorative front pages for the college football playoff semifinals that were distributed in the stadiums on New Year’s Day. The scene is familiar to sports fans: The final seconds tick by on the scoreboard clock, cannons fill the stadium with confetti and a new championship team is crowned. Jubilant players and fans, eager to celebrate the moment, hold newspaper pages to commemorate the victory in a lasting image. News organizations share in the victory as well. A nationally televised shot of a smiling player holding their printed product is the ultimate earned media placement. Audiences see a trusted news brand and associate it with winning coverage. Even as print newspapers have become a smaller part of the news business, the strategy has evolved to feature online brands by replacing the traditional newspaper nameplate on the front page. Holding up a screen can’t compare; newspapers are the original mobile content app. 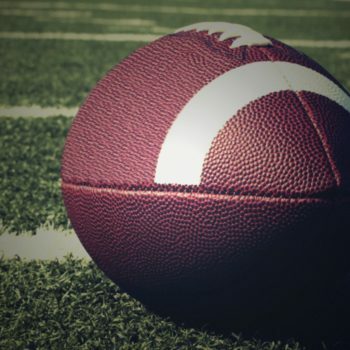 As managing editor for The Birmingham News and content director for AL.com and Alabama Media Group, the state’s largest news organization, I led the production of championship fronts covering four straight years of national championships — three for the University of Alabama and one for Auburn University. Big games always attract large online audiences, and big victories stoke demand for commemorative editions, posters, books and other keepsake products. We capitalized on this football frenzy frequently by sending to the games a few hundred of what we called “stunt papers,” which were designed by their very presence to signal to our audience that the newspaper offered comprehensive coverage. Over a decade, the paper has perfected the process. We were undefeated at getting papers on the field and getting noticed. Think outside the box: Brands want to be associated with influencers, wherever your audience finds them. Earned media placements aren’t limited to traditional stories in media outlets. Think where your audience is and find creative ways to connect, such as at events. Offer value: The postgame newspaper pages are successful because they’re easy to see, convenient to hold and compelling to display. Nobody forces players and fans to pick up the page. Likewise, your content should provide value to your audience, rather than solely promoting your brand. Seize the moment: Great placements are all about timing and execution. Develop relationships and partnerships with organizations whose interests align with yours. Providing memorable words and images in the right place at the right time can resonate long after the original event passes. As with any effort, a little luck never hurts. Our stunt page strategy was a calculated gamble. If the home team lost, our marketing plans also suffered defeat. The pre-produced pages never saw the light of day and were quickly destroyed. Listen to your audience. Taking steps to ride the wave of your audience’s passions can increase your odds for significant exposure and a big payoff for your brand. 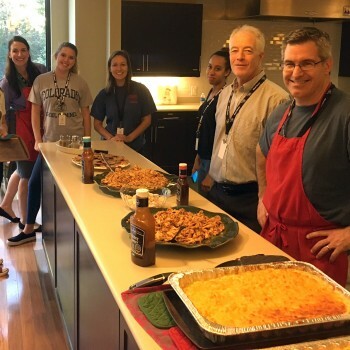 Scott Walker is vice president of content and digital strategy for Poston Communications, based in Atlanta.